Tykes with an aspiring green thumb will appreciate the new Flower Set that has just blossomed into the PlanToys collection. Made with recycled PlanWood and child-safe paints, this sweet little play set allows your child to ‘grow’ a seed blossom into a beautiful flower. The stacking aspects encourage your tot to focus on refined small muscle use and controlling her hands, fingers, and thumbs. The set includes plenty of gardening tools: a chunky seed, soil, watering can, shovel, garden shears, stackable stems, 2 leaves, and 4 interchangeable flower petals. 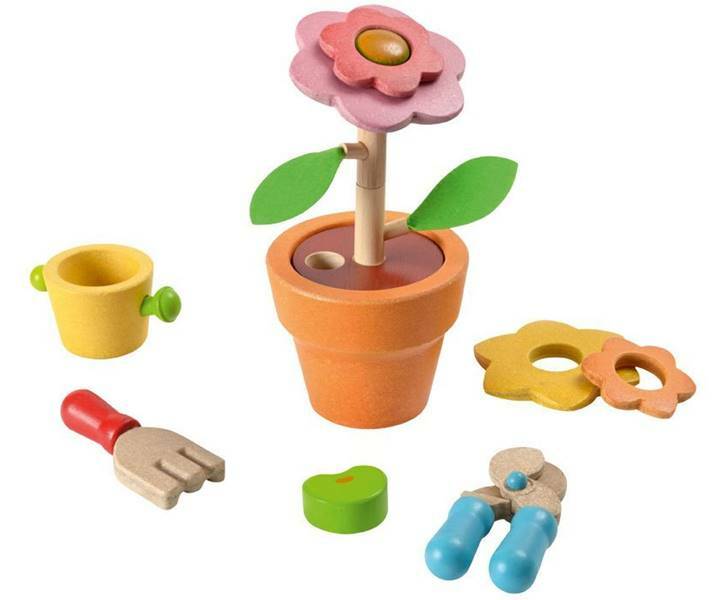 Tykes with an aspiring green thumb will appreciate the new Flower Set that has just blossomed into the PlanToys collection. Made with recycled PlanWood and child-safe paints, this sweet little play set allows your child to 'grow' a seed blossom into a beautiful flower. The stacking aspects encourage your tot to focus on refined small muscle use and controlling her hands, fingers, and thumbs. The set includes plenty of gardening tools: a chunky seed, soil, watering can, shovel, garden shears, stackable stems, 2 leaves, and 4 interchangeable flower petals.